This project was featured in Boston Magazine! 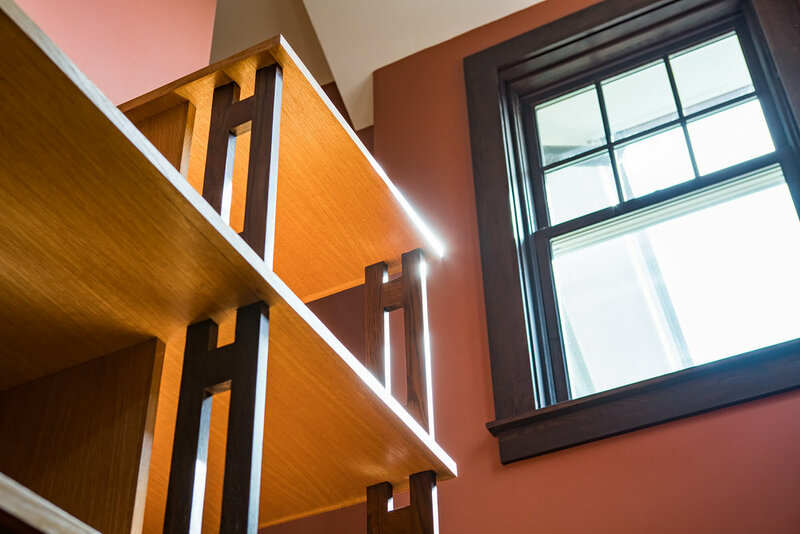 For this project in Watertown, we built an addition off the back of the clients existing home – adding a dream master bedroom suite with a luxurious master bath and an additional second floor bedroom. Our architect on this project designed a very modern structure with lots of angles and sharp points. He also designed the 100% custom interior trim work and cabinetry, built by our team. When you walk into the space, the common area is separating the main home from the addition space. The first thing to catch your eye is the beautifully detailed staircase to the second floor bedroom with an 18 foot high angled ceiling. When you step into the master bedroom you pass a laundry closet on your right. 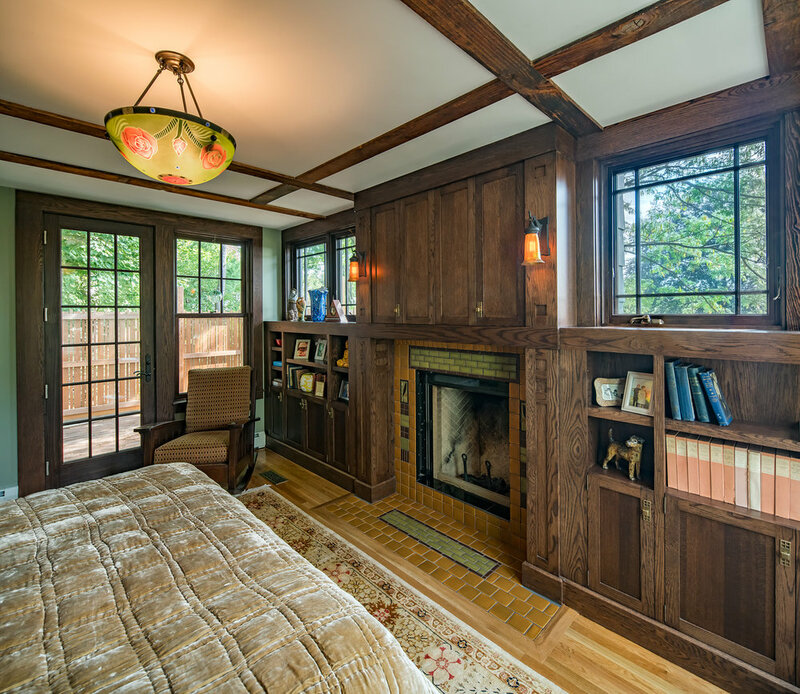 The room has oversized double hung windows for ample natural light as well as a “wow factor” wall of custom built-in bookshelves and a hidden television cabinet above a wood burning fireplace, surrounded by imported tile. The door off the master leads to a private mahogany deck with custom lattice work to hide the sunken jacuzzi. Back in the bedroom, slide the pocket door open to enter a large master bathroom. You are surrounded by imported wall and floor tile, with high ceilings, a double vanity with recessed medicine cabinet, custom grooming/makeup vanity and a walk in closet. 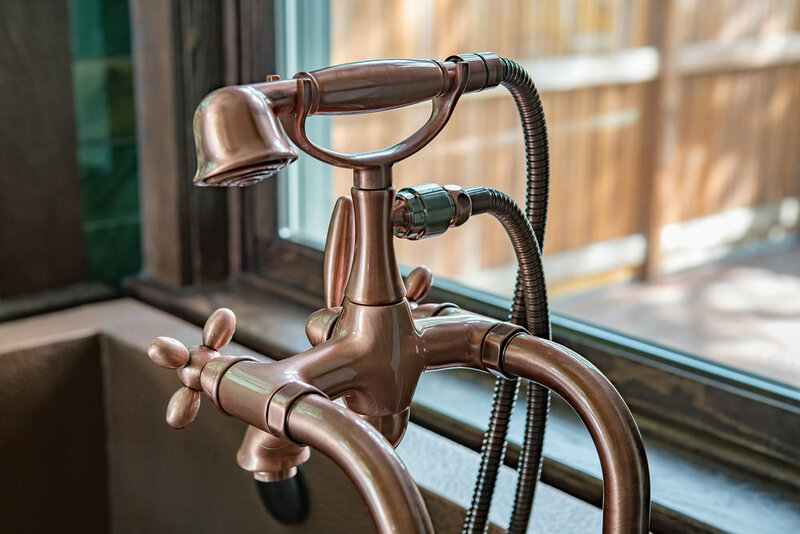 Yet, what truly makes the space is a freestanding copper sitting tub, next to which is an open shower area with copper finishes and a glass block exterior wall. Other features on this project include a metal roof, window seat, custom firewood storage box on the exterior, mortise door hardware throughout, and an electric wall mount towel dryer.